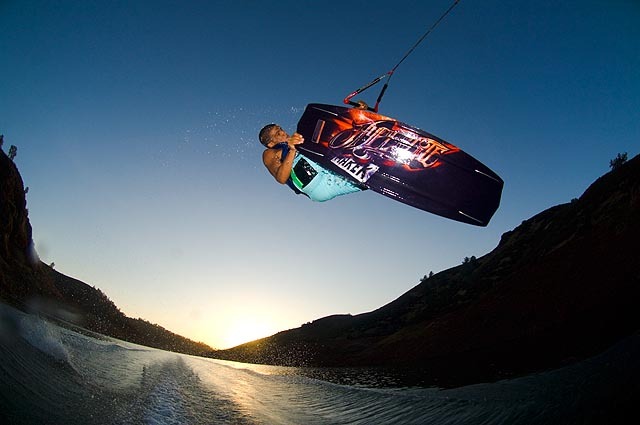 This week’s Photo Battle comes straight from the pages of the latest issue of Alliance Wakeboard Magazine. If you haven’t picked one up yet, get to your local pro shop and grab on STAT. 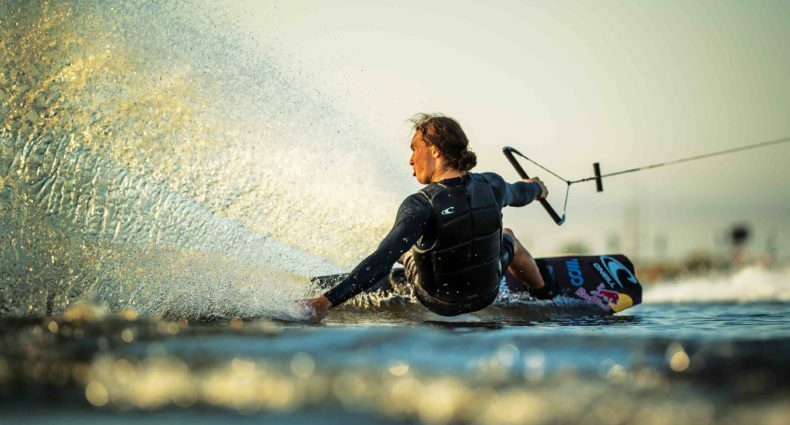 Last summer the California contingent of Hyperlite riders converged in the centrally located confines of Lake McClure and Mike Schwenne’s West Coast Camps houseboats for a little weekend of friendly competitive shredding. It was So-Cal vs. Nor-Cal in a battle for photographic dominance. Cali native photographers Rodrigo Donoso and Spencer Smith were teamed up with the riders — it was gonna take some good shredding and serious creativity for somebody to come away with the prize. The photos you see in this week’s Photo Battle are each photographer’s favorite shot from the weekend. For Spencer Smith and team Nor-Cal, it’s a shot of Brodie Chaboya boosting a big stalefish, while for Rodrigo Donoso and team So-Cal, it’s none other than wonder kid Jacob Valdez with a dirty little tail poke. 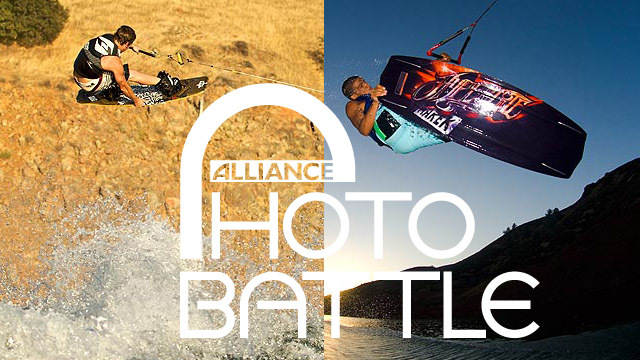 These two photos just got some great play in the latest issue of Alliance, but now it’s up to you guys to decide which one is the winner of the Hyperlite Nor-Cal vs. So-Cal contest. There are no prizes for this week’s battle (except of course glory for the rider and photographer!) but starting next week, Hyperlite will be kicking down some apparel packages to the winners of our regularly scheduled battles, so get your shots in for a chance to win! Brodie holdin it down for Northern Cali! Give them something for winning this week, Brodie needs some swag. Throw him a towel at least, everybody is tired of seeing his crusty junk on the boat. so-cals pic would have taken it if the flash didnt ruin it. the photographer had his flash too high and the subject (the rider) refected it. he could have put it in photoshop, but what ever. Personally, I like the picture of Valdez. And as a photographer, getting the exposure down just right for a picture like that is not a simple task. With the low lighting that's aimed directly at the camera, the flash had to be bright enough to light the rider. Not to mention having all settings in the perfect spot to freeze the rider. Both pics are pretty nice, but the pic of Valdez got my vote simply for creativity and technical skills involved to capture this shot. Best of luck to both! the pic of brodie is a good one but it seems so generic, i feel like we have all seen that shot before. jakes photo may not be as crisp as the other because of the lighting angle but it is just oozing style all over, and like matt said it is def a creative shot. Yeah Brodie! 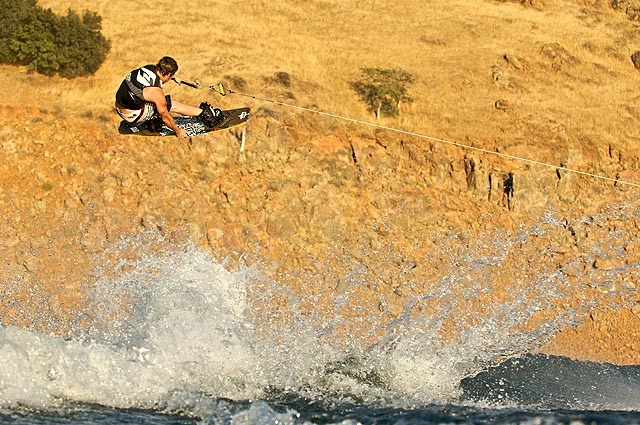 Rippin' it NorCal style! its nott letting me vote, (someone might wanna check up on that could explain why valdez is behind in the votes)but i deff gotta say jakes got this one. really showinggg thatt style that so cal is known for. good job jake. i think this battle is too political. the so cal picture is so much better but the nor cal riders vote for nor cal riders… like politics, there is no truth! SO-CAL!!!!!! Rodrigo kills it everytime with his shots! IN MY OPINION, i feel a lot of people are judging on the rider themselves as opposed to the photographer and what it took for them to get the shot. Both photos and riders are dope. Based on what it took to get the shot Rods looks more difficult to get involving a handful of factors (tube, flashes, daylight etc). The best of luck to you both! My vote is Valdez. What a HOT SHOT !! I have to agree.. I live in Nor Cal and it seems as if most people are voting based on geographical location and for their local rider's.. But if this is a photography contest… I have seen quite a bit of Rodrigo's work, and I must say this one is no different, Sweet shot..He killed it as usual!!!! Awesome work Rod….. If it was based on geographical location it would be tied. Rod and spence both live in norcal. And as for generic pics. I see a lot more chaseboat shots than photog floatin in the water. Keep on rockin in the free world! Must say jacob's Pix Is Awesome! I've Seen It In Person and to catch this shot is a pretty tricky task, very creative! 🙂 Team SO CAL!!!!!!!!!!!! With a lot of the other cats on here. Everyone seems to be voting based on the rider. Brodie is sick as F%$K, but I've seen that angle on a shot 100's of times. Rod actually put some work into settin up his shot. My vote is with Rod(Team So-Cal)even though Rod is as Nor Cal as they come!! I think its a win win for nor cal…. Rodrigo for team so-cal, wtf? Like I said…Nor Cal vs. So-Cal. Has nothing to do with the actual shot. Definitely a sick shot with the hillside and water wrapping up the side of the lens. Color contrast gives it a real clean pop… Amazing job Rodrigo! These things are all pretty subjective. Both Jacob and Brodie are friends and I like Rodrigo and Spence is obviously at the top of his game so this is hard to vote for. Being subjective and picking your favorite photo is always hard. People like to support their friends and help them when they can. That being said I voted for Brodie because believe or not that is a hard shot to get. Not saying the tube shot was easy, Rodrigo has a lot going on in that photo being on a tube the sunlight in the background so having to use the flash to fill the shot. It's a great shot. Being a sitting duck in the water with no housing from what i am told, timing everything focusing quickly and getting the grab and poke on the stalefish was hard to do. Plus shooting against the rock shoreline and being able to get Brodie to stand out makes that shot look cool. Brodie, That is an EPIC shot! Check out the air underneath you. Rock on Buddy! BRODIE TEARIN' IT UP AS USUAL !!!!!! !